I’m not sure what to make of this: a new study from a USC professor concludes that the air on the Gold Line light rail is cleaner than the Red Line subway — and that both are far cleaner than the air along freeway corridors. The reason for the difference between the subway and Gold Line is dust generated by the braking of the subway in the confined corridors of the tunnel. The news release doesn’t say much about an issue I think is important: time of exposure to the air on both systems. At the bottom of the following USC news release, the researcher — Prof. Constantinos Sioutas — says that he supports expanding L.A. County’s rail system because it’s far cleaner than cars and buses. Commuters on the Los Angeles Red Line subway are exposed to higher levels of potentially hazardous components of particulate matter in the air – in some cases twice as much – as commuters on the above-ground Gold Line light rail, according to a new USC study. However, the Metro system’s levels of these air pollutants, some of which are known carcinogens, pale in comparison to the levels of particulate matter that bombard commuters stuck in traffic on the freeways. Constantinos Sioutas, Fred Champion professor of civil and environmental engineering in the USC Viterbi School of Engineering, measured the concentrations and chemical composition of fine and coarse particles in the air while riding on the Red Line and the Gold Line of the Los Angeles Metro using small carry-on suitcases equipped with portable air samplers. He also tested the air quality at USC to act as a control site that the represents typical urban air quality levels in LA. The amount of particulate matter in the air on the Gold Line was similar to that in the air at the central USC, while the amount measured on the Red Line was significantly higher. Sioutas attributed the additional particulate matter in large part to the dust produced by the braking of trains approaching stations in the enclosed environment of the subway. Sioutas, who uses the Gold Line in his commute to work at USC, said that even the Red Line’s air is an order of magnitude cleaner than the air that commuters face on the freeways in Los Angeles. 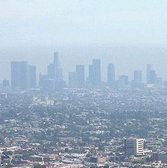 “The air in the light rail system is quite typical of what we breath in urban LA if not actually cleaner; however, several studies by our group and others in the past decade have shown that the concentrations of deleterious particulate air pollutants inside freeways, to which millions of commuters are exposed daily in LA, are anywhere from five to 10 times higher than an urban site. This makes the exposure levels in the light rail and even the subways lines much, much lower than those inside freeways and busy arterial routes,” Sioutas said. His findings were published online by Environmental Science and Technology on July 5. The American Lung Association likens the damaging effects of particle pollution damages to those of cigarette smoking, linking it to respiratory and cardiovascular illness, among other things. “It’s really an array of health effects,” Sioutas said. For that reason, though Sioutas is a supporter of public transportation in general, he said he believes the future lies in expanding the county’s rail system. “There’s no other way. Buses are not the answer as they contribute to both traffic congestion as well as to air pollution,” he said. Sioutas’s upcoming research will focus on providing more accurate data on just how unhealthy those streets are by equipping moving cars with air quality sensors. Until now, most measurements of street air quality have relied on sensors placed on the side of roads, which do not capture the full extent of pollution that commuters are subjected to, Sioutas said. It is a shame you haven’t linked to the source material. It is not clear from the quotes whether the study compares the quality of the air on the freeways or inside a typical vehicle traveling on the freeways. This would make a difference. And in other news, USC professor upons research concludes, raw vegetables such as carrots are healthier than french fries at McDonald’s. Does anyone find it ironic that a large stretch of the gold line (and green line for that matter)is in the middle of said freeway traffic. So wouldn’t the gold line passengers have the same fate of the people in cars on the freeway. I think this study might be a tad bit flawed. The Dude, I don’t see the flaw in the study. Of the Gold Line’s 21 stations, THREE are freeway stations. The rest are either street-level, elevated or underground. Any data from the freeway air would be dilluted by data from the other, cleaner stations. Not every station is going to be equally clean, but on average, the results are still going to be better than freeway air. This study does not surprise me one bit as it is a logical and expected conclusion when dealing with air in an enclosed space and petroleum vs electricity. However i must say that the dude abides makes a good point in bringing up freeway median transit with regards to this and should be a consideration when building new rail lines regardless of it being HRT or LRT (most people refer to HRT as just “subway” but its actually a misnomer as LRT can also be a subway). I don’t generally oppose freeway median rail as long as the train can detour off of it for direct destination stations, but this point does put it into question as to how healthy it is. Maybe this will lean the sepulveda pass rail project more towards a subway tunnel rather than in the middle of the 405. Also I think a pair of bored tunnels are actually going to end up being simpler than having to deal with adding more space to the 405 median, general construction impacts and engineering challenges in dealing with an existing freeway, digging out chunks of hills or mountains, the steep grade, extra structures for veering off etc. It’s always best to link to the study so we can read more about it besides what you extracted here. It also lends you credibility — how do we know you haven’t filtered or reframed the conclusions? thanks. I’m assuming the dust created by braking is the brake pad dust. I know that older brake pads contained asbestos. After a quick search, I see that asbestos in pads was outlawed in 2003 and a new compound, aramid, is now being used. Now, not sure how must to trust the study, but researchers say that inhaled aramid fibers are biodegradable in the lungs, where asbestos is not.. and is carcinogenic.